and Zachary Rynar, Senior Advisor, for US Senator Robert Menendez. Since then we have been in touch with Senator Booker’s office and hope to host George at a future Indivisible meeting. Summary notes of September 8, 2017 Meeting with Zachary Rynar, Senior Advisor, for United States Senator, Robert Menendez. Introduction of Indivisible Monroe Twp as an advocacy group. Development of on going communication and relations with staffers. Understanding the Senator’s priorities and identifying common subjects for collaboration. Advocating for Indivisible’s legislative priorities. Translating these priorities into legislation and passage into law. High costs of prescription drugs: not justifiable, uniform, monitored or transparent. Prices must be regulated and capped by the federal government. Markups are unreasonable and don’t pass any rational economical test. Monopolistic behavior by pharmaceutical and insurance industries: Lobbyists and political donations reign. Industries are virtually untethered in setting prices and negotiating among themselves. Congress must take a stand and enforce anti-trust and fair practice measures. Isn’t tweaking a drug so that the patent remains protected basically price manipulation, unfair practice that prevents competition since generics are prevented from entering the market? We expect Congress to address and demand justification for this unconscionable perk to pharmaceutical companies – finally. The NIH and tax payer contributions without reciprocity: We subsidize research and clinical trials. Pharmaceutical companies receive huge returns on investments. We want fair give back, an open market and incentives for innovators. Impeding drug importation and negotiation: We oppose tying the federal government’s hands in negotiating costs or importing drugs. Price disparities between drugs sold in the US vs the same drugs sold more inexpensively in other countries have no rationale beyond profiteering. We will work to strengthen broader access to affordable prescription drugs through drug importation legislation. We demand that Congress pass provisions to permit Medicare /Medicaid/other bodies to negotiate drug pricing. 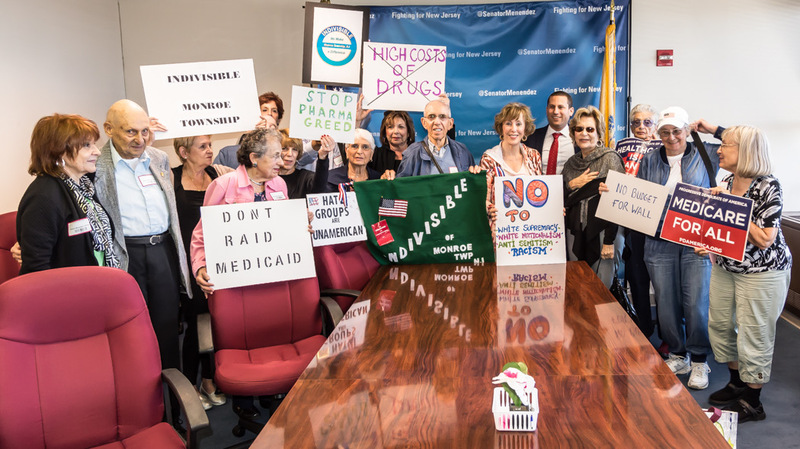 We expect the Senator to vocally and persistently promote the package to IMPROVE ACCESS TO AFFORDABLE PRESCRIPTION DRUGS which includes a number of bills inclusive of the above components. We want to see the package translated into a bill and into law. If not, we expect legislation to ease drug importation to alleviate barriers and inequities in prescription drug acquisition. We request that the Senator continue to strongly support and work with the other side of the aisle to advance universal coverage, prevent voucherizing or defunding Medicaid, Medicare, or provisions of the ACA. To ensure that currently insurance companies be funded (cost sharing for low income) to maintain stability and service. Bartering and horse trading away Social Security and Medicare/ Medicaid dollars and benefits. Defunding of critical middle class and low income services, such as, housing support, food stamps, lunch subsidies, and education; Denial of Medicaid to 14 million people. Removal of property and state tax deductions from federal income tax. We do not want to eviscerate socially beneficial programs to pay an unnecessary $23 billion for a massive wall, more detention centers, detention officers, or deportation forces that are not even supported by some border states. A fair budget and fiscal policies that focus on middle class and low income needs. An increased and fair minimum wage. We affirm first amendment rights but demand safety from our police services and a Congress that stands firm against these groups. Congress must reject defunding programs dedicated to education and defanging racist elements in our society. WE WANT increases – NOT DECREASES – in Homeland Security and FBI budgets for this purpose. WE are very concerned about efforts to potentially disenfranchise voters or create obstacles to voting. We thank the Senator for sponsoring the Anti Voter Suppression Act and ask that he continue his work to disband the Voter Fraud Commission and fight against administrative and geographic barriers to voter registration and the voting process.